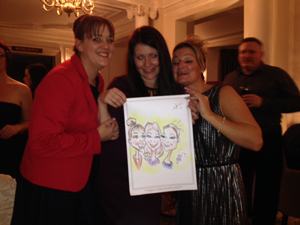 I have worked at lots of different types of weddings, from extremely posh and formal functions to totally chilled and relaxed outdoor Bo-Ho style and I can tell you from experience that caricatures work at both ends of the scale! 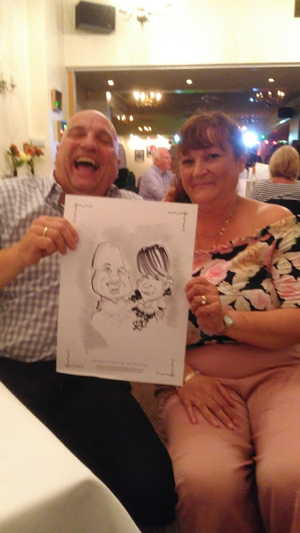 Whether I am walking around drawing or setup with a nice queue of people chatting and mixing, caricatures add a smile to the day and a fantastic gift of the special day for guests to take home. 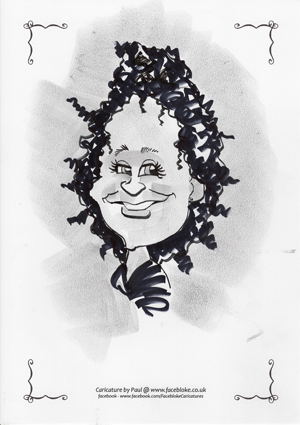 During the drawing process I'll happily chat to your guests, I have lots of funny stories to tell and it becomes part of the entertainment to help relax people whilst I draw but also it's nice for me to get to know them. What time works best on the day? 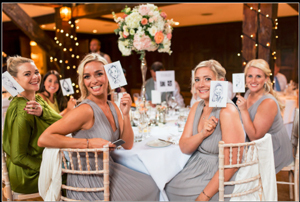 There are really 3 options for booking me which seem to work very well at weddings. 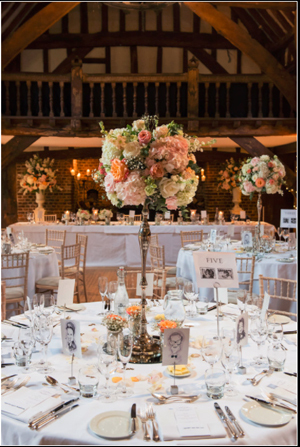 The shorter booking times from 1 - 2.5 hours are ideal for filling gaps, so for example I'll entertain people whilst photographs are being done of the bride & groom, close friends and family. The longer times which can go from 2.5 - 4 hours plus are perfect for the general entertainment along with disco's, magicians, photo booths etc. In addition to people getting a unique hand drawn caricature on the spot (singles, couples or groups) people also like to watch so it creates a focal point for people to talk, laugh and join in conversation. 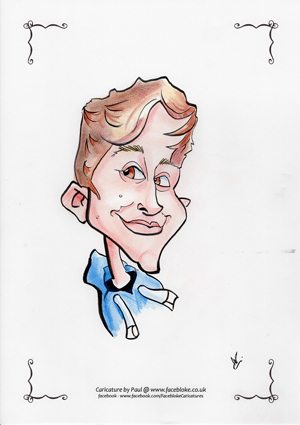 What caricature options are available? Black and white or full colour? 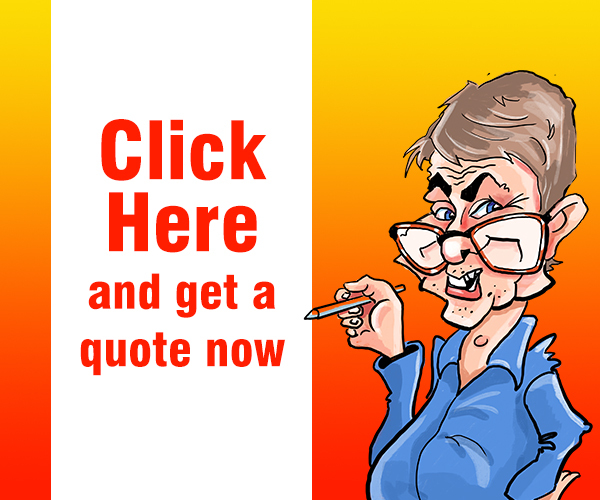 The first thing to decide is whether you want black and white (with tone) or full colour. Both are very popular and it is really down to personal choice (see examples). 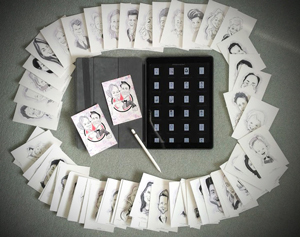 Black and white is the fastest taking on average 3-4 minutes per person and full colour a little longer 6-7. 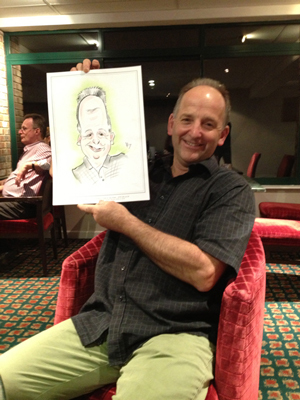 Next is whether you want digital or traditional style caricatures. 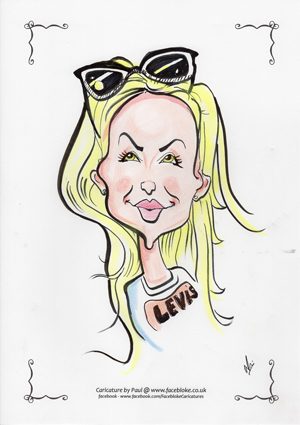 Digital caricatures I draw on my Ipad or Surface, it's still done by hand but the image will be saved as a digital file. 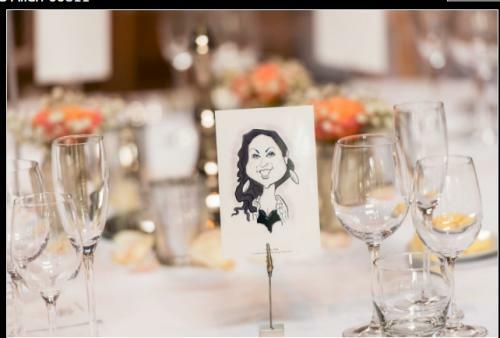 Once the drawing is done (your guests can watch what I am drawing on the picture framed screen) i'll turn my Ipad around and show the guests, then i'll send the file to print onto a glossy postcard which the guest can take away. All the files from the day can be saved and uploaded after the event to a storage area for people to access and download. 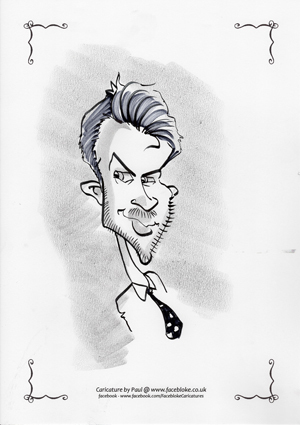 Traditional caricatures I sketch on A4 paper (unless you request A3), the paper has a nice border pre-printed so the caricature is framed. Once complete I show the drawing then roll up and put an elastic band around to make it easier to carry. Some people have asked me to keep all the pictures back, so I show them (most people take a photo on their phones) then i'll get them to write their name on the back and they go in a tray - This allows the hosts to see/scan all the images before sending them out themselves. Set up or walking around? Mostly for weddings people have me set up in a designated area, this way I can have the pull-up display next to me which shows what I do along with the time I'll be working until. I can work anywhere with a small table or a few chairs or in the bar area. I also have my own chairs for setting up in a garden or outside in the summer time. 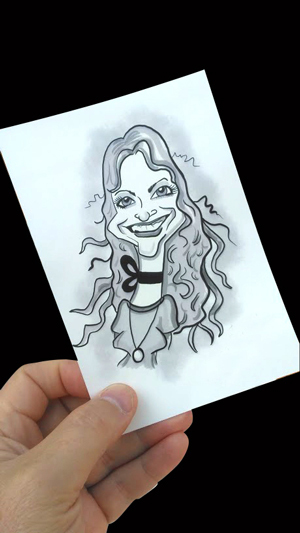 I often get an informal queue forming which is great as people chat to each other and watch me draw, often heckling etc - all part of the fun! 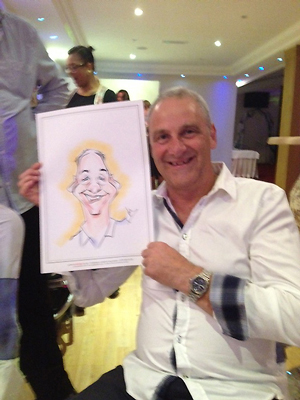 I also draw 'on the hoof', walking around drawing which is often used in my corporate gigs where i'll work around diners whilst they are sat eating or move around groups and mingle drawing as I go. If I am walking and drawing I cannot offer full colour or A3. 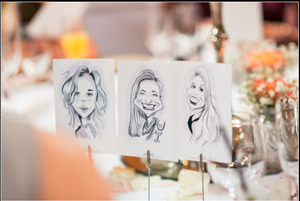 Working from photographs I can produce caricatures printed on glossy postcards which make excellent place settings - not only is it a fun and unique way to for people to find their place at the table but also a gift they can take away with them! 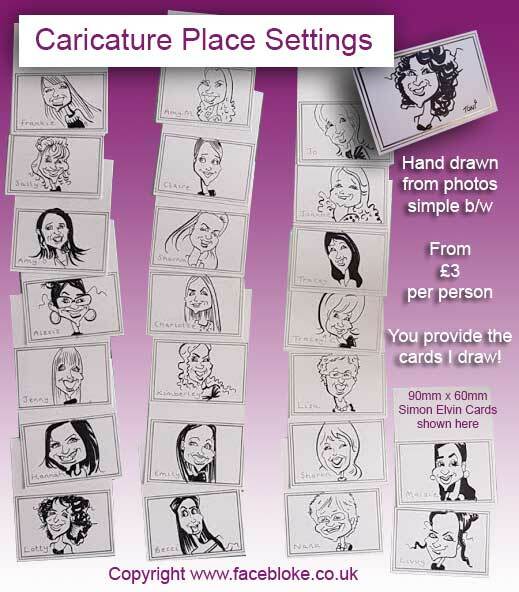 You can choose from black and white or full colour, have the date or a message of your choice on the bottom/top. I work in batches of 10, once signed off I'll print them and then get on to the next batch until they are all done. The price is based on the total number required and whether they are mono or colour. 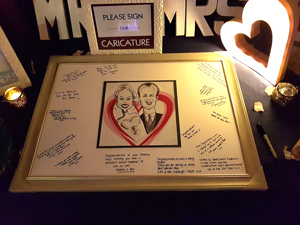 I often get asked to create a caricature of the bride and groom which is then printed on a large board and can be signed by guests along with personal messages, it's a great way of remembering the day. 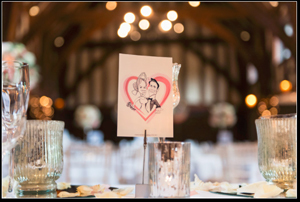 A framed caricature of the bride and groom surrounded by meaningful items to make it very personal.